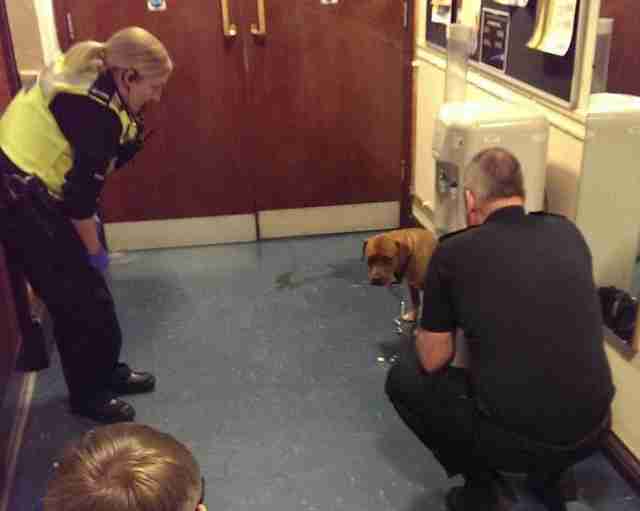 When police in Dudley, U.K., got a complaint about a homeless man and his dog who were sleeping on the town's streets earlier this month, they decided to do everything possible to get the pair inside and safe. But the sad truth is, many shelters and temporary housing options don't allow pets - and some men and women have been forced to choose between their beloved animals and a home. Perhaps fearing that officers would take away his dog, the man sleeping on the Dudley streets avoided their attempts to help. Finally, officers arrested him, which, in another situation, might have meant separating him from his dog forever. But not in this case. "Our team were able to work with a range of specialists to fast-track his case," a spokesperson for the Dudley Police Department told The Dodo. "With everything in place the man was released without charge." On Thursday he will be able to move into a hostel - along with his beloved dog. And while he was in custody, officers made sure his pup, anxious without her owner, was well taken-care of. They recognized that this dog and her dad may not have a home, but they're still a family. And they deserve to stay together.